"..the candles are brilliant and as effective as the BIOSUN ones (or more so). We look forward to ordering some more. We have also given your details to other therapists in our area." Prices include VAT @ 20% and 1st class delivery within mainland UK. Please note: If 'Paypal' buttons not working properly, page may need to be refreshed. We accept several payment methods. Thermo Auricular Therapy (also known as Hopi Ear Candles) is a pleasant and non-evasive treatment of the ears, used to treat a variety of conditions. These ear candles induce a revitalising heat upon the head and ears, which soothes, relieves and relaxes. This is an ancient and natural therapy handed down by many civilisations. It is believed that the Ancient Greeks used ear candles, initially probably for cleansing, purifying and healing on a spiritual basis, but much later on a purely physical basis. However, the practice reached the modern world via the native American Hopi Indians of North Arizona (it's interesting to note that Hopi means peaceful people). Ear candles were used traditionally by Shaman healers. 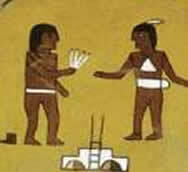 Ancient wall paintings show their importance in initiation rituals and healing ceremonies of the tribe. The candles are still made today on the basis of the old traditional formula originating from the Hopi Indians. The magic of fire has fascinated people from the very beginning of time and Ear candles evoke a similar fascination having been used by many cultures since ancient times. The peoples of the Siberian prairies, Asia and native North and South American Indians mention Earcandles in their myths, with ancient rock paintings showing Earcandles being used at initiation rituals and medicinal ceremonies. It is said the Hopi, the oldest Pueblo people, who possess great medicinal knowledge and spirituality, brought this knowledge to Europe, however there is little if any evidence of this. The healing properties of the Hopi Ear Candle has its foundation in two primary physical actions. Firstly, the slight under pressure (the chimney effect) inside the Ear Candle and the vibration of the rising air column serve to gently massage the ear drum and promote secretion in the frontal and paranasal sinuses. This has an immediate subjective effect of regulating ear pressure. Users often describe a soothing, light sensation in the ear/head area. Secondly, the locally applied warmth stimulates vascularization , invigorates the immune system and reinforces the flow of lymph. At the same time, important acupuncture points and reflex zones are stimulated. Secretion flow is gently stimulated and the vapour collects and removes impurities or deposits. Most of these are carried away through the candle "chimney", although some of them can be found in the condensed candle wax residue after removal from the ear, or could even work their way up to the surface 24-48 hours after. EarCandles are excellent in the treatment of nose and throat congestion, sinusitis, headaches, T.M.J. pain, tinnitus and otitis externa/tropical ear. Ideal relaxation treatment for stress or anxiety related symptoms. Softens earwax for easy removal. However there is no scientific evidence to prove any of this so we make no claims. It is advised to have a second person (ideally a trained therapist) to make sure that the ear candle is vertical during the session and to extinguish the candle safely at the end. An alternative method would be to sit on a chair with the candle held horizontally, however this may not be as relaxing. Ear Candles are easy to use. Ensure that the atmosphere is calm and relaxed, so that the Ear Candle can display its full effect. The patient can contribute here by keeping his/her eyes closed. Before the therapy is started, ensure that there are no draughts in the room. Place a glass of water within reach, so that the remainder of the Ear Candle can be extinguished after it has burned down. As a precaution, the surrounding region of the head may be covered with a cloth. Take precise note of the following instructions and their sequence. Lie the patient down on his/her side in a comfortable position. Support the head slightly so that the auditory canal is in the vertical position. It is best to sit on a chair by the patient's head. Now you can light the Ear Candle at the end without the printing. The EarCandle will continue to flame throughout the treatment. Fit the Ear Candle (not the burning end of course!) gently, but tightly into the auditory canal with a gentle twisting movement. If the candle fits properly, no mist should issue from between the Ear Candle and the ear. You can also cover the surrounding area with a cloth. Hold the Ear Candle loosely between the forefinger during the therapy. Do not squeeze tightly together! Keep the Ear Candle as vertical as possible. The patient will experience a pleasant crackling and rustling noise during the burning, in the final phase, the heat flow intensifies comfortingly and pleasantly. Leave the Ear Candle in place until it has burned down about 2/3 of its length, to 1cm above the printing/logo. Carefully remove the remainder of the Ear Candle and extinguish it in the glass of water. After both ears have been treated, we recommend a subsequent rest of 10 to 15 minutes. This greatly assists the overall effect. The patient should remain lying down and can be comfortably covered with a blanket. Gently massage the ear, face and neck to enhance the effect. Check the ear canal for any condensate residues. Remove these carefully with an ear cleaner or small wooden stick. Do not push the residue back into the ear. Do not use a cotton bud. As a safety precaution it is advised to have a second person to make sure that the ear candle is vertical during the session and to extinguish the candle safely at the end. No, these are not Biosun candles nor are they of the tapered variety. However those types are available directly from us. Is there a book about Ear Candling & Hopi Ear Candles? Our suppliers have been making these ear candles for over 10 years, based on a special formula. They have been tested on over 150 patients at the Acupuncture Rehabilitation centre in Warsaw and have a certificate to say the ingredients are safe and hygienic: PZH nr HK/B/0815/01/99. Hopi ear candles Length: 30 cm; Diameter: 9 mm; Weight: 5.5 grams. Burning time: minimum 10 minutes. Our Hopi candles are packed in sets of 2 pcs in a polyethylene bag with a set of illustrated instructions for use. They are made of pure beeswax and raw unbleached cloth with the addition of pure natural essential oils (see below). The ending that comes into the ear is protected with metal foil inside and sterilized in pure spirit. Made in E.U. by beekeepers and contain only pure natural essential oils. " How much are these Hopi Ear Candles? Prices include VAT & delivery within mainland UK. Also please see our terms & conditions. Orders of between one and 25 pairs: Sent by Royal Mail first class post within 1-2 working days of receiving cleared payment. Orders of 12 pairs and below are normally packed in postal tubes which may not fit in a regular letter box. Orders of 50 pairs or more are normally sent by Royal Mail's 'Special Delivery' service (guaranteed next day delivery by 1pm noon), included in price. Orders sent by first class mail should arrive within 1-2 working days after posting. If your order has not arrived for 15 days, since time of posting, please contact us by e-mail and we will contact Royal Mail and file for compensation, and send a replacement order. We always keep a proof of posting, and tracking information if applicable. With orders sent by special delivery, if order doesn't arrive within 1-2 days please contact us as soon as possible. Ear candles are for home remedy use only not as substitute for proper medical care. If in doubt consult a G.P . This product and similar products here are not affiliated or produced by the Hopi people or tribes, nor are we associated with Hopi people. Please see our terms and conditions for more information. "I purchased a couple of the hopi candles off you last week and found them to be really effective, just as good as the considerably more expensive Biosun ones! " Doug O. "...I will definitely contact you again in the future when I need some more as I found them very effective." Cheryl B. "The last lot you sent me were fantastic and have sold really well, I was absolutely thrilled with them!" Virginia S.
"Thanks, arrived this morning, great service." John T."Received candles next day, excellent service thank you." Mary E."My daughter bought 6 pairs of these a little while ago for me, but she 'borrowed' a pair, as did my wife, then her friends so I thought I'd better increase the quantity on this order! thank you, and kind regards." Stuart R.
BioSun EarCandles - Biosun Earcandles use only pure beeswax, honey extract and traditional herbs such as Sage, St. John's Wort, Camomile and pure essential oils. Mixed Packs available.